We have recently discussed the importance of routinely considering the value of implied volatility in a historical perspective for each underlying before considering any of the various option positions potentially appropriate for trading a given underlying security, index, or ETF. Failure to consider this data represents a major cause of the failure of otherwise favorable option positions. That is not the end of the story with implied volatility and understanding “the rest of the story” can give a trader a substantial edge in selecting and designing options trades. It is important to remember that implied volatility is not some vague theoretical value; it is derived from the actual market prices at which options trade. From a mathematical viewpoint, implied volatility is the number required to be entered in one of the various options pricing models in order to arrive at the current market price of the individual option under consideration. Since this is a moment-to-moment empirically derived value, it is very dynamic and is reflective of the aggregate traders’ viewpoints of the magnitude of future price variations. Certain reproducible patterns are routinely observed in the variations of this value. 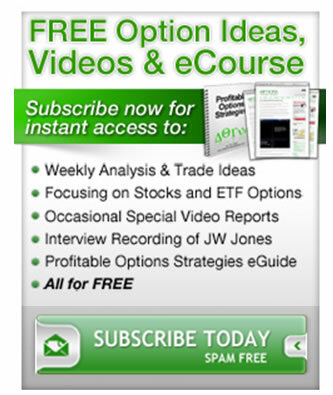 Three recurring patterns are extremely critical to recognize as an options trader. The first is the increase in implied volatility prior to known events that can reasonably be expected to impact price of the underlying. Specific events would include things such as earnings releases and, in the case of biotechnology companies, FDA decisions impacting various devices or drugs. The second tendency is for implied volatility to revert to its historic mean. Each underlying has a typical range of implied volatility that is reflective of its individual “personality”. For example, the personality reflected in the implied volatility of XOM is quite different from that of GOOG. The third pattern is that of seasonality. Implied volatility typically contracts during the summer months as trading volume and large price moves are generally not likely. The only large price fluctuations are likely to participate in the Hampton vacations of Wall Street traders. None of these three characteristic tendencies is graven in stone, and each is subject to the most expensive five words a trader can utter, “This time it is different.” These are historical tendencies that can be overwhelmed by the specifics of a given situation. But these personality characteristics of implied volatility are not the main point I want to discuss over the course of my next few articles. The often overlooked characteristic of implied volatility is its usefulness in predicting the magnitude of future price volatility over a variety of time frames. We first need to do a bit of review of some basic statistical concepts; stay with me, I promise there is a reason to understand this seemingly arcane material. It is necessary to understand the basics of the nuanced language in which the implied volatility speaks. In order to do so, we need to review some fundamental statistical concepts in order to be able to understand what implied volatility is telling us. Prices of underlying assets can be considered to lie along the path of the familiar “bell shaped curve.” This is familiar to all students of statistics and is variously referred to as a “log normal” distribution or a “Gaussian” distribution of prices. The curve below represents the theoretical distribution of price of a stock. Individual prices cluster around the mean and as they become more distant from the mean value, the individual prices occur at an ever decreasing frequency. As indicated on the legend of the graph, the standard deviation (SD) measures how broad the distribution width is; a small SD reflects a very “tight” distribution width while a large SD reflects a broad distribution width of prices. 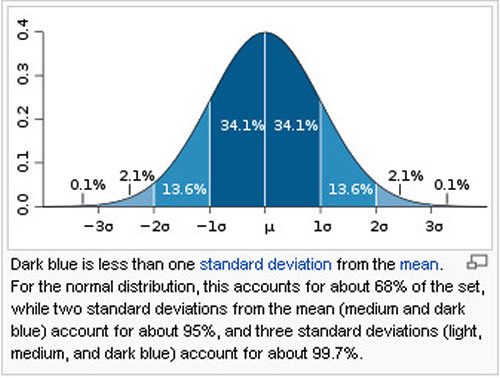 Since the Standard Deviation defines the portion of price variation within a given range, the probability of success of a trade that has a broad range of profitability can be easily calculated. In my next missive, we will look at some real world examples of the utility of this calculation.